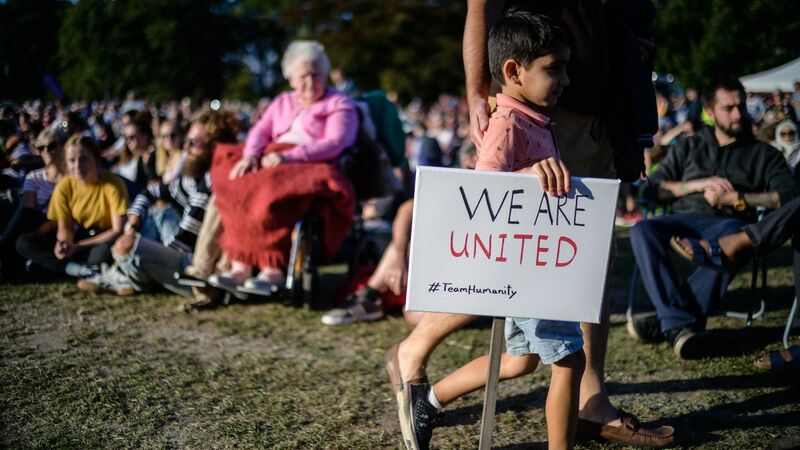 Tens of thousands of New Zealanders gathered to rally against racism and other forms of extremism at a vigil honoring the victims of the Christchurch terrorist attacks Sunday evening local time. The latest: In Christchurch, Alabi Lateef Zirullah, imam of Al Noor Mosque where 42 people were killed, opened the Hagley Park vigil with an Islamic prayer. "Whatever happens will never, never separate us. This is New Zealand, we live in Aroha," the imam told the crowd, referring to the Māori word describing love and compassion. The names of all 50 victims were read out at the event, which used the stage intended for a Bryan Adams concert that was canceled in the wake of last week's attack. Okirano Tilaia, head boy at Cashmere High School, which lost two students in the attacks, invoked civil rights icon Dr. Martin Luther King, Jr. during his speech. "Darkness cannot drive out darkness, only light can," he said. "We do not let these horrific events define who we are." University of Canterbury Muslim Students’ Association president Bariz Shah asked whether white supremacists were afraid of diversity. "Through knowledge we can eradicate ignorance," he said. "And once we have eradicated ignorance, we cannot act foolishly in the future." In Auckland, New Zealand's most populous city, hundreds of protesters displayed signs calling for "love not hate."